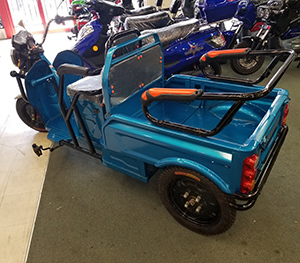 The Crusader is a 3 wheel E tricycle that is meant to carry and hold a larger then normal load then you would take with your self on your everyday e bike. The crusader has a foldable rear seat which will turn the trunk space into a big storage box. 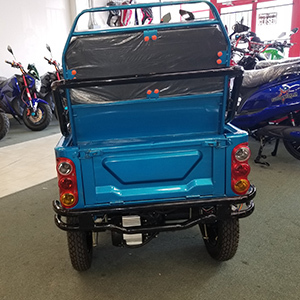 In turn the storage box is attached to leaf springs that can unlock and lift up the storage compartment. ( Crusader comes with a tailgate). 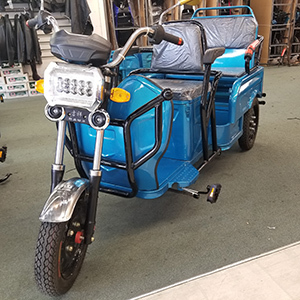 Crusader has a 500 watt motor and a 500 watt 20 AMP controller which is also high torque, to ensure maximum power while using the tricycle on the road. 60 volt 20 AH Batteries are installed under the driver seat and should have a range of in between 60-70 KM per charge. Crusader will get you & your passenger or your grocieries/tools and get the job done! Great for people with balance issues or people who need to store tools everyday or just for running errands.